Mayor Edwin M. Lee today announced with community-based organizations, the Human Rights Commission, and the Office of Civic Engagement and Immigration Affairs the launch of the Equity and Immigrant Services Campaign, a multi-pronged effort for the continued support of immigration legal services. 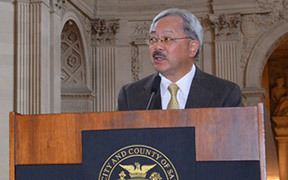 This year, Mayor Lee dedicated $3.8 million to serve the legal needs of the City’s immigrant community. Following the presidential election, Mayor Lee met with many of the community-based organizations that serve San Francisco’s immigrants and heard the concerns and needs for more resources. These community-based organizations are the gateway for many families to get the services they need such as, legal representation, health care, and education. Subsequently, Mayor Lee moved forward with dedicating an additional $1.5 million on top of the $3.8 million already funded to expand and bolster immigration-related legal services in fiscal year 2016-2017. In total, Mayor Lee has pledged nearly 14 million dollars for immigration-related services over the next two years and has committed to increasing those funds if needed.